﻿﻿ 元帅（Grand Admiral) - Wookieepedia - 星球大战中文网 Star Wars China - Powered by Discuz! "A knack for doing the impossible was one of the things Grand Admirals were selected for." Grand Admiral was one of the highest ranks in the Galactic Empire (besides Emperor, Supreme Commander, Executor, and Grand Vizier), outranking all other political and military personnel, including Moffs. In the reconstituted Sith Empire, the rank was known to have been given to at least one officer in the Imperial Armada. Its importance in the Armada was unknown. The rank was used by the Imperial Armada of the resurgent Sith Empire, with Harridax Kirill being the only known Grand Admiral in it. Grand Admirals were appointed by Emperor Palpatine and answered directly to the Emperor, or his authorized executors, in all matters. The creation of the rank of Grand Admiral two years before the Battle of Yavin was widely recognized as a means to increase the Emperor's direct control of the Imperial Military. However, although all exceptionally gifted officers, the Grand Admirals were not just front-line commanders; rather, they included several technical specialists and theoreticians, enabling them to serve as a leadership cadre for the whole military—and indeed the whole Empire. At least one Grand Admiral was given the position of warlord upon achieving the rank; the same was possibly true for the rest of the Grand Admirals as well. During the height of the reign of the Empire, there were twelve Grand Admirals in service, called the Circle of Twelve by Palpatine. At the time of the Battle of Endor, marked by many as the beginning of the fall of the Galactic Empire, the group included Martio Batch, Nial Declann, Octavian Grant, Josef Grunger, Ishin-Il-Raz, Afsheen Makati, Danetta Pitta, Peccati Syn, Miltin Takel, Osvald Teshik, Rufaan Tigellinus, and the Chiss Mitth'raw'nuruodo (better known by his core name, Thrawn). Thrawn had been officially promoted a few months before the battle as a replacement for Demetrius Zaarin, who had attempted a coup against the Emperor, although it appears that the Chiss had, in fact, been promoted in secret at an earlier stage. The Grand Admirals were visually distinguished from other officers in the Imperial armed forces by their gleaming white uniform, sometimes worn with bullion epaulets and rank insignia, sometimes without any badge of rank. It is unclear whether the Imperial Army or stormtrooper rank of Grand General was equivalent with the rank of Grand Admiral, but Ysanne Isard, as Director of Imperial Intelligence, wore a red version of the Grand Admiral's uniform, and her power and position in the Imperial hierarchy could be considered analogous. The Rebel Alliance accounted for all of the Grand Admirals, save Thrawn, in the first years after Endor. Ten were killed or executed, and only Grand Admiral Grant was allowed to go quietly into retirement following his defection. 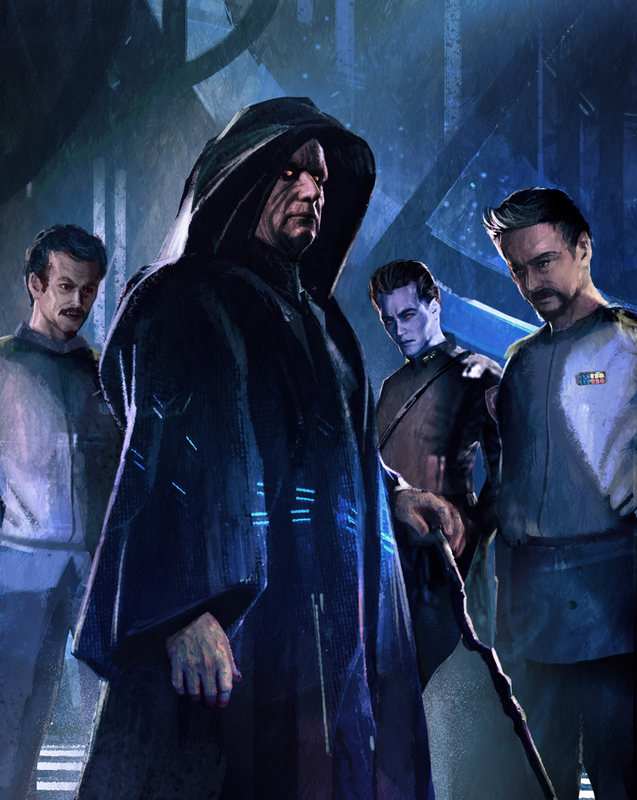 Palpatine's Dark Empire appeared to have revived the rank before Thrawn's assassination, with meetings between the new circle of Grand Admirals taking place aboard the uncompleted Eclipse in drydock over Byss. Palpatine's own death seemed to have marked the extinction of the college. However, the prestige of the rank meant that a number of warlords like Zsinj and Admiral Larm, adopted some of the trappings of Grand Admiral's rank. After the signing of the Bastion Accords, the Council of Moffs revived this esteemed rank for Gilad Pellaeon, already Supreme Commander of the Imperial Fleet and head-of-state of the Imperial Remnant. As of the war with the Yuuzhan Vong, Pellaeon and the long-retired Grant were the only living Grand Admirals, although rumors persist that Pellaeon's mentor, Thrawn, somehow cheated death and remained active in the Unknown Regions. The rank appeared to have become synonymous with Supreme Commander as commander-in-chief of the Imperial military possibly as early as 28 ABY. Evidence exists of Pellaeon referring to himself by a longer form of the rank: "Grand Admiral of the Imperial Navy".Coupled with Moff Kurlen Flennic's threat to "appoint another Grand Admiral" in Pellaeon's place rather than appoint another Supreme Commander seems to indicate that the rank of Grand Admiral was increasingly becoming something of an honorific title of posting than a rank of military promotion. Indeed, by the Sith–Imperial War, the Fel Empire's form of the rank, held by Grand Moff Morlish Veed and also by Rulf Yage following the Massacre at Ossus, seems to have followed this trend. In Krayt's Empire the Grand Admiral was Joint-Supreme Commander alongside the Fist of the One Sith. Most references showed the insignia for a Grand Admiral as six blue squares with three yellow and three red; an alternate version of the rank badge seen in some images displayed seven blue and red squares, with two code cylinders. Heir to the Empire author Timothy Zahn introduced the rank of "Grand Admiral" for the villain of that novel, Grand Admiral Thrawn. Zahn wanted Thrawn to be a military leader rather than a political title-holder or darksider, but felt a normal Admiral would be too mundane. He therefore decided to use the title "Grand Admiral," which he had encountered while reading William L. Shirer's The Rise and Fall of the Third Reich in the context of its use in the German Navy.